EPA Administrator Scott Pruitt is calling for a “red team/blue team” review of climate science that would attempt to cast doubt on well-established science and lend an outsize voice to fringe scientists. The idea spread from a climate-denying scientist to conservative outlets like The Daily Caller and The Wall Street Journal to Pruitt, and now more right-wing outlets are promoting it. The EPA should constitute a “Red Team” of analysts, independent from the climate modeling industry, to judge the current state of knowledge, i.e. the current state of how much we know about the “why” of climate variations. Such an examination would provide transparency to the process and give confidence to the public that the agency values open examination of its methodology. Christy told the [Senate Subcommittee on Space, Science and Competitiveness] he believes the attempt to study climate change objectively is thwarted by the federal funding process. Christy, a well-known climate change skeptic, suggests Congress can fix the problem by directly funding independent “red team” programs. A main mission of red teams would be to challenge the scientific consensus on climate change, including the work of the United Nations’ Intergovernmental Panel on Climate Change, whose reports are widely considered the authority on climate science. The national-security community pioneered the “Red Team” methodology to test assumptions and analyses, identify risks, and reduce—or at least understand—uncertainties. The process is now considered a best practice in high-consequence situations such as intelligence assessments, spacecraft design and major industrial operations. In the days after that interview, right-wing outlets picked up on the idea again. The Daily Caller reported that it “could upset the supposed ‘consensus’ on man-made global warming.” Breitbart said the proposal “has naturally caused massive upset among the ivory towers of climate science academe” where researchers “aren’t at all used to having their dodgy theories exposed to serious scrutiny.” The right-wing website Daily Signal, the conservative blog Power Line, and the climate-denial blog Watts Up With That also highlighted Pruitt's interview and the red team proposal. In advocating for a “red team” review of climate science, Pruitt, Koonin, and right-wing media are glossing over the fact that climate science already has a method for testing assumptions and analyses: the peer-review system. Climate science papers submitted to respected journals are reviewed by other scientists in the field to assess their soundness and validity. Climate science has already been litigated ad nauseum in mainstream forums. 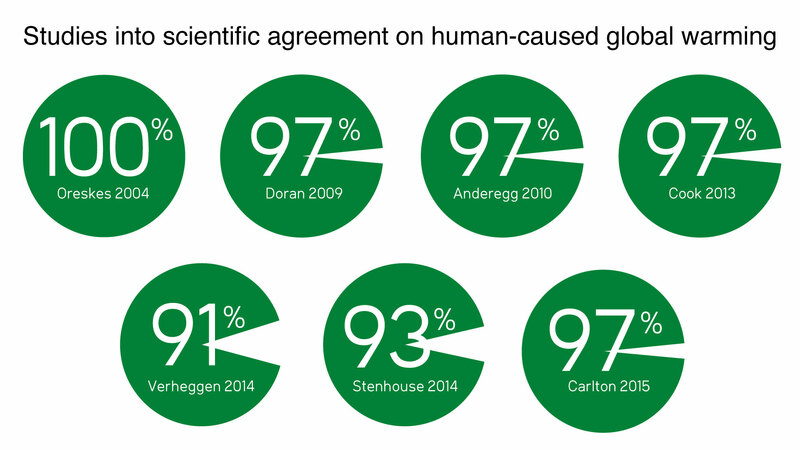 Numerous studies have found that the vast majority of climate scientists agree that humans are the primary cause of global warming. And recent studies examining the robustness of that consensus have reaffirmed it; about 97 percent of publishing climate scientists concur. Creating a “red team” could lead to scenarios like the one at a House science committee hearing in March, when climate scientist Michael Mann was outnumbered by fringe scientists and forced to be the sole representative of the scientific consensus on climate change. “We find ourselves at this hearing today, with three individuals who represent that tiny minority that reject this consensus or downplay its significance, and only one—myself—who is in the mainstream,” Mann said in his opening testimony. Though fringe, right-wing media have played a substantial role in spreading the “red team/blue team” proposal and other denialist ideas, mainstream newspapers also bear some responsibility. 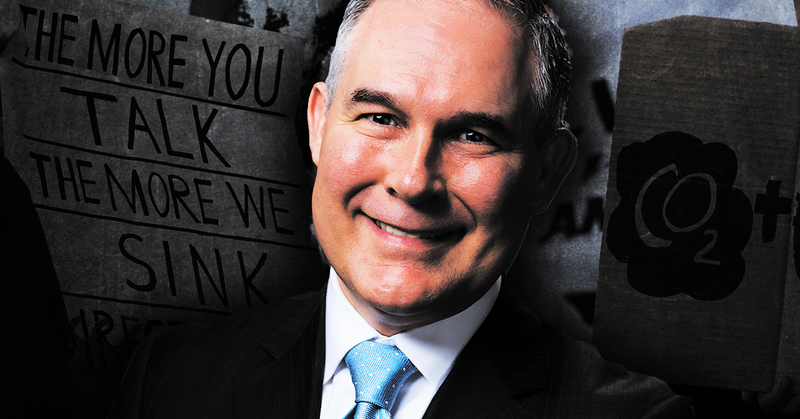 When Pruitt referenced Koonin’s op-ed, it was the second time in less than a week that he had lifted an argument from the opinion pages of a major newspaper to cast doubt on established climate science. On June 2, standing at the podium of the White House press briefing room, Pruitt cited an error-riddled, denialist New York Times column by Bret Stephens in order to downplay “exaggerated” concerns about climate change. As a Media Matters study conducted last year demonstrated, climate denial remains a significant problem in the major newspapers. The world has just endured the three hottest years on record, and newspapers are still allowing their opinion pages to be used to deny climate change. That trend is all the more alarming now that the Trump administration is quickly adopting those denialist arguments. Republican and conservative media figures lauded a report from CBS' 60 Minutes on the September 2012 Benghazi attacks, using it to advance their attacks on the Obama administration and Hillary Clinton. But that report has since come under fire following the revelation that the piece's key Benghazi "eyewitness" had previously claimed he was nowhere near the compound on the night of the attack. Following the terrorist attacks in Norway by anti-Muslim fundamentalist Anders Behring Breivik, the right-wing media have leapt to defending their own Islamophobic response to the attacks, often by making absurd claims like calling Breivik a "jihadist." The right-wing media reacted to President Obama's address on troop withdrawals in Afghanistan by dredging up familiar, petty attacks, such as criticizing the number of times Obama referred to himself, and claiming the address was a "campaign speech" instead of a "war update." This follows a long history of the right-wing media launching frivolous attacks over speeches Obama makes on all manner of issues. Right-wing media reacted to news that Democrat-backed JoAnne Kloppenburg emerged from Wisconsin's Supreme Court election with a small lead by predictably bringing up baseless allegations of voter fraud. The right-wing media regularly uses voter fraud to respond to elections where a Democrat wins or is winning, especially following a close race. Following the memorial service for the victims of the tragic shooting in Tucson, several in the right-wing media attacked and mocked the inclusion of a Native American blessing as part of the invocation. Fox News has run repeated segments attacking some progressive media figures and politicians for suggesting that political rhetoric from the right inspired the recent tragic shootings in Arizona. In doing so, Fox has whitewashed right-wing media figures who have attempted to describe Loughner as a liberal and pin the shooting on "the left." In recent days, right-wing media figures and outlets have attempted to make hay over Clinton-era documents which they falsely claim demonstrate Elena Kagan's "willingness to manipulate medical science" for political purposes. In fact, Kagan did no such thing. The documents in question center around the drawn out debate concerning late-'90s legislation which would have banned, under most circumstances, so-called "partial birth" abortions. The Clinton administration's position was that the ban would be acceptable, provided there was a narrowly-drawn exception to preserve the health of the pregnant woman. The Clinton administration also endorsed a ban on late-term abortions that also had a narrowly-drawn health exception. Kagan served as a legal advisor to Clinton at the time and was involved in providing policy recommendations to the administration on the issue. Terminating a pregnancy is indicated in some circumstances to save the life or preserve the health of the mother. Intact D&X is one of the methods available in some of these situations. However, a select panel convened by ACOG could identify no circumstances under which this procedure, as defined above, would be the only option to save the life or preserve the health of the woman. Notwithstanding this conclusion, ACOG strongly believes that decision about medical treatment must be made by the doctor, in consultation with the patient, based upon the woman's particular circumstances. The potential exists that legislation prohibiting specific medical practices, such as intact D&X, may outlaw techniques that are critical to the lives and health of American women. The intervention of legislative bodies into medical decision making is inappropriate, ill advised, and potentially dangerous. In a December 14, 1996, memo, Kagan wrote that it would be a "disaster" if the ACOG issued this draft statement as its final statement. Kagan's files also include handwritten notes titled "suggested options," and those notes include language that mirrors ACOG's publicly released final statement on the "partial birth" abortion bill. The right-wing blogs are screaming that this is evidence that Kagan interfered with "medical science" to advance the Clinton administration's politics. But Kagan did no such thing. ACOG's final statement is perfectly consistent with the draft statement and with ACOG's medical panel's assessment that it "could identify no circumstances under which this procedure, as defined above, would be the only option to save the life or preserve the health of the woman." Indeed, the panel's assessment was still included in ACOG's final statement on the issue. And none of the right-wing media attacks have even plausibly suggested a way in which ACOG's draft statement and its final statement conflict. Right-wing bloggers and Rush Limbaugh are pushing an absurd distortion of an AP report on a meeting on human rights to claim that the U.S. "apologized" to China over the Arizona immigration law. In fact, nothing in the reports indicates that the U.S. "apologized" to China. [Assistant Secretary of State Michael] Posner said in addition to talks on freedom of religion and expression, labor rights and rule of law, officials also discussed Chinese complaints about problems with U.S. human rights, which have included crime, poverty, homelessness and racial discrimination. Right-wing media strain to portray Kagan as a "radical"
Right-wing media figures have been quick to portray Supreme Court nominee Elena Kagan as a "radical" or an "activist." In fact, Kagan is considered "one of the more moderate choices" for the Supreme Court and has been described as "fair-minded" and "well-respected" by conservative political and legal experts. After the Security and Exchange Commission accused Goldman Sachs of fraud, numerous right-wing media figures have accused the Obama administration of attempting "to destroy Goldman Sachs" in order to "shift public opinion" in favor of financial reform. Simultaneously, conservative media have also falsely claimed that the financial reform legislation creates a "permanent bailout fund," which is "the payoff" Wall Street "has been waiting for." Right-wing blogs seized on initial reports of an attempted shoe bombing on a domestic flight over Denver -- reports which later turned out to be inaccurate -- as an opportunity to politicize what they believed to be an attempted terrorist attack. The Weekly Standard's Stephen Hayes, National Review's Ramesh Ponnuru, and Power Line's Paul Mirengoff are among the conservatives to recently reject comparisons trumpeted by other right-wing media figures of Sen. Harry Reid's controversial comments about President Obama to former Senate Majority Leader Trent Lott's past comments in support of Strom Thurmond's 1948 segregationist presidential campaign. Hayes, Ponnuru, and Mirengoff join several civil rights leaders and other media figures in rejecting that comparison.